This evening's documentary on Channel 4 proved to be an entertaining affair, helping to bring to life one of Shakespeare’s greatest historical villains, whilst also allowing his current supporters to put in many a good word on his part (yes, I too was astonished to find that he has living advocates). Found last summer in Leicester’s Greyfriars Car Park, it was a remarkable stroke of luck that the remains of Richard III came to light in the very first trench excavated. Indeed, this chance discovery has already spawned a rather charming tale that will be sure to pass into the folklore associated with the monarch, for the driving force behind the project – Philippa Langley of the Richard III Society – stated that when she first visited the car park she experienced a strange sensation “right over the letter R” painted onto the tarmac. Astonishingly, it was below this spot that Richard’s bones lay. In situ, the skeleton displayed a pronounced curvature of the spine, which came as a shock to Langley, for she and her fellow Society members had taken the line that Richard’s hunchback was a piece of malicious Tudor propaganda. Whoever this was, he had suffered from severe scoliosis and had met a violent end, for the skull bore wounds inflicted at the time of death or thereabouts. As the remains were boxed up and removed from the site, Langley wished to drape them with a replica of Richard’s standard, but some of the others had misgivings in case the bones proved to belong to someone else. Nonetheless, draped they were and off they went for further scrutiny. The next task of course, was to determine the identity of the remains, but how? Not one of the monarchs who came after Richard was a direct relative, so it fell to Michael Ibsen, a seventeenth-generation descendant of the king’s sister, to provide a source of contemporary DNA, which proved to be a match with that of a skeleton. 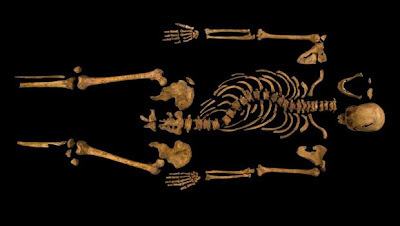 Moreover, radio carbon dating placed the skeleton in the appropriate timeframe of 1450-1540 given Richard’s death at Bosworth in 1485. A CT scan of the skeleton was made at a nearby hospital to construct a 3-D image. The differing sizes of his clavicles – with the right being significantly larger than the left – was suggestive, combined with the pronounced scoliosis - of the possibility that one shoulder appeared higher than the other. There was no sign of a withered arm, but his arm bones were gracile, showing him to have been slight of build. 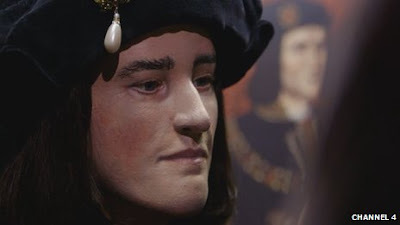 Members of the Richard III Society who spoke to the presenter via webcam were quite indignant at the suggestion that Richard actually may have possessed a spinal deformity. Moreover, they appeared to be convinced that he had not had a hand in the murder of the princes in the Tower; a partisan bunch who would happily have quarrelled with members of the Henry VII Society, should such an entity exist (astonishingly, it seems that it does! Welcome to, The Henry Tudor Experience (although without wah-wah pedals and LSD)!). The evidence of the bones however, would seem to suggest that Shakespeare was correct in having Richard say "I, that am not shaped for sportive tricks". Could it be that the political villain of our age, Tony Blair, will excite such support 500 years hence from those who aver that "He was no warmonger! He was a decent and honest man who cared for his people!" We can only hope not, though some may well wish that in future he comes to rest beneath a car park and stays there. The traumas displayed by the skull seemed to tally with contemporary accounts of his death in which he was finished off with a poleaxe, with the wounds inflicted after his helmet had been removed. A small entry wound on the top of the skull appeared to have been inflicted by a rondel dagger. There was also a massive slice to the base of the skull that probably finished him off. Another wound was inflicted after death on his pelvis, probably by a dagger. The forensic reconstruction of Richard’s face proved to be somewhat kinder than the few posthumous portraits that exist, and elicited an emotional response from Langley who looked upon the face and once again averred that this was not the face of a man capable of the evils attributed to him by his successful rivals. However, this would, so the evidence of the disappearance of the princes in the Tower suggest, be more in line with wishful supposition than likelihood, for the boys had stood between Richard and the throne which he had taken for himself. Whereas the Wars of the Roses are long over, it would seem that even after having been dead for over half a millennium Richard still has the power to generate conflict, but this time around it will not thankfully involve any loss of blood, but merely a civic spat as to where his mortal remains should rightly lie. The current intention is for his skeleton to be buried in Leicester Cathedral, but a rival Yorkist challenge is being made, appropriately from the city of York itself. It is, some claim, a matter of record that Richard had planned for his resting place to be York, for he had made provision for the construction of a vast chantry attached to York Minster that would be able to accommodate 100 monks praying for the wellbeing of his soul. Leading the lobbyists for the interment of the remains in York Minster is Kersten England of the City of York Council. On this evening’s Look North she voiced her hope that an intervention by the Queen would lead to a change of plans, but how sympathetic would the monarch prove to be? What does she think of Richard? Leicester Cathedral is certainly a very modest structure, which was a humble church until elevated to cathedral status in 1927, hardly the sort of building in which a mediaeval king of England would have been content to rest. York Minster on the other hand, is one of the great gothic cathedrals, and would thus provide a suitably grand setting, but wherever he is laid to rest, it is unlikely that the receptacle will take the form of a sepulchre akin to the type in which other monarchs of the period were interred. Given that Leicester Cathedral lacks the draw of York Minster, it would likely welcome any tourism and associated donations that come with it. For this reason if no other, there seems sure to be a tussle over Richard’s crumbling remains. One place however, is unlikely to attract tourists of any type: the car park beneath which his skeleton was found. Lancastrians, presumably, will look upon the affair with an air of amused indifference. Now that the remains of Richard III have been found, will anyone be moved to search for those of Alfred the Great, whose tomb was destroyed during the upheaval of the Reformation? Perhaps that would be an even more difficult task, for if they were to be found, whose DNA could be cross-referenced? "Philippa Langley of the Richard III Society – stated that when she first visited the car park she experienced a strange sensation “right over the letter R” painted onto the tarmac. Astonishingly, it was below this spot that Richard’s bones lay." I think the programme was a little economic with the truth there. There is plenty of technology for detecting bodies/skeletons underground, often used by the police in mass murder cases, such as Fred West. "The most widespread forensic geophysics technique is Ground Penetrating Radar, or GPR. Initially developed to detect landmines, it got its first big break in 1994, when it was used to locate the victims of serial killers Fred and Rose West." I visited Gloucester police testing station, when they still had the machine and generator used to run it. I had a good chat with one of the officers involved (I was dropping off a test generator sample) and they're pretty efficient. The forensic specialist's face was priceless when Langely started crying and ran out of the room after seeing the bones. Her behaviour was a bit over the top in my opinion. I can understand that you would have a sort of emotional attachment to a certain degree to the project you've spent a lot of time on,but she came across a bit fake. Read your entry with interest. Langley was annoying. You would think she was his widow with her constant crying. As for the 'R' in the car park and the rain when the bones were found, I think Channel 4 were taking artistic licence and it made the show come across as more of a joke than a serious historical program in my opinion. One position however, is unlikely to entice visitors of any type: the car recreation area below which his bones was discovered. Lancastrians, presumably, will look upon the event with an air of entertained apathy. Langley looked and sounded like a Jennifer Saunders creation.